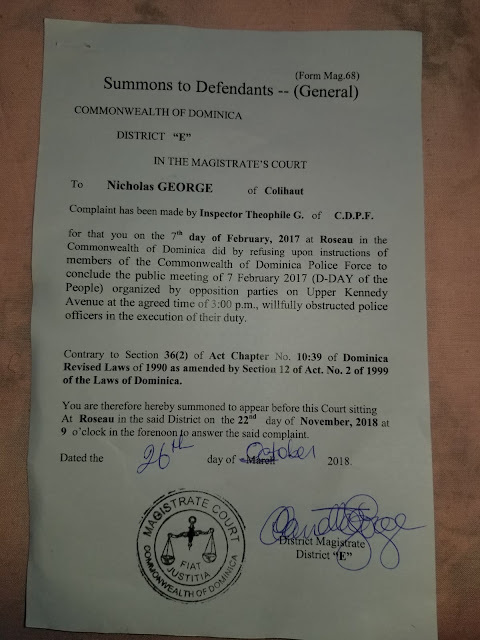 The Magistrate's Court in the Commonwealth of Dominica, obviously acting on the orders of the Prime Minister and his Cabinet, have notified Opposition leaders that the charges pending against them, of Willfully Obstructing the Police in the Discharge of their Duties, which were set for hearing on March 28, 2019 have been moved up to November 22, 2018. (1) Seeks major reform of the flawed and corrupt election process, where the Skerrit government pays bribes to voters, provides them free airline travel from abroad at voting time, and awards voters temporary employment at voting time. (2) Has demanded that the illegal cash sale of diplomatic passports to foreign nationals be terminated, and any and all funds illegally connected be disgorged to the government treasury. (3) Wants reform of the Citizenship by Investment (CBI) program, and the assignment of all CBI receipts towards government projects. Will the Opposition leadership be imprisoned, and if so, will that act result in the isolation of the Commonwealth of Dominica in the East Caribbean Community, and also by the US & UK ? It is believed that the intent of the Skerrit government is to see that all the major Opposition leaders are in custody when he calls the next National Election on December 18, 2018.